Photo by Randy Roberts. Handler Tim Brazier, of Mill Creek, is all smiles behind Ally, a standard poodle, after winning best-in-show March 10 at the prestigious Seattle Kennel Club Dog Show. Judge Randy Garren, of Apex, N.C., is at left. Club members Julie Hamasaki and Don Hanson, president and chief ring steward, are to the right of Brazier. 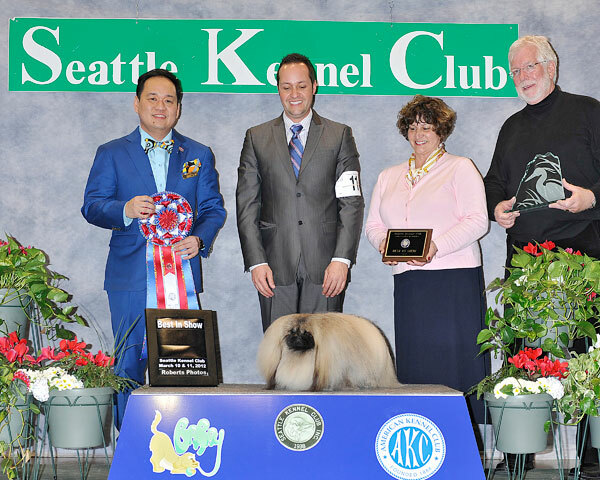 A smooth-flowing, young Pekingese on the rise and a statuesque standard white poodle with nothing to prove captured best-in-show titles March 10-11 at the Seattle Kennel Club Dog Shows in CenturyLink Field Event Center before 8,000 spectators. Both dogs added back-to-back Group 1 wins (toy and non-sporting) to their impressive resumes, but their handlers had equally upbeat stories of their own. The Pekingese, Grand Champion Windemere’s Dusting of White at Pevyne (Dusty), gaited by breeder-owner-handler (somewhat of a rarity) Cody Koch, of Reno, Nev., captured its sixth all-breed best-in-show – fourth this year — to go along with 35 Group 1s in what is appearing to be a breakout year on the national scene. He was given the win in a strong Select Seven field by judge Ekarat Sangkunakup, of Thailand. Dusty is the No. 3 toy breed and No. 13 all-breed in the national American Kennel Club points standings this year. 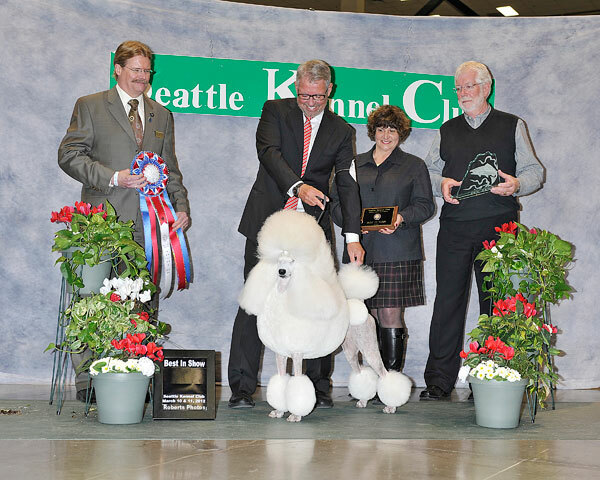 The Saturday winner, Grand Champion Brighton Lakeridge Encore (Ally), a stunning white standard poodle, was handled by Tim Brazier, of Mill Creek, in his first outing since triple bypass surgery four months ago in Seattle. The two didn’t miss a beat in sweeping through breed and group competitions both days; the best-in-show was the 3½-year-old Ally’s fourth this year, the three earlier ones coming under the handling of Brazier’s longtime friend, Taffe McFadden, of Acampo, Calif. The BIS, given by judge Randy Garren, of Apex, N.C., was Ally’s 70th, to go along with more than 150 group wins. Ally was the nation’s No. 4 show dog last year. McFadden, who had her own health issues while battling with cancer last year, piloted Ally to 12 best-in-show wins since November with Brazier on the sidelines. Photo by Randy Roberts. The March 11 best-in-show title at the Seattle Kennel Club Dog show went to Dusty, a Pekingese, handled by Cody Koch, of Reno, Nev. The Select Seven competition was judged by Ekarat Sangkunakup, of Thailand, at left. Club members Julie Hamasaki and Don Hanson, are at right of Koch. After stepping into the breed ring Saturday, Brazier’s comfort zone was established quickly. “It didn’t take long to get the feel that I was back,” he said. Other than Dusty and Ally, the only other repeat group winner was 3½-year-ol d Champion Afterall Painting the Sky (Sky), a wire fox terrier. Handled by Gabriel Rangel, of Rialto, Calif., this dog has been on a roll in 2012, winning back-to-back bests-in-show at the International Kennel Club Dog Show in Chicago last month. “She’s a real Cinderella story,” says Rangel. She finished her championship in early 2010 but made few appearances in 2011, with the exception of the World Dog Show in Paris, where she wowed the judges with a third-place finish in an entry of 38,000. One of the most fascinating stories of the show is Champion Eskai’s Sir Kasper (Kasper), a 2½-year old red-bone coonhound handed by Kevin Chestnut, of Moses Lake, that took the hound group Sunday. A show dog part of the year, he is a field worker during the Idaho cougar, bobcat and bear hunting season beginning in late fall. Owned by 12-year-old Stephen Hendrix, of Tum Tum, Wash., the 78-pound Kasper is a strike dog, which is arguably the most important member of a hunting pack team. The strike dog is prized for its ability to efficiently search through all types of cover and terrain for game. Sporting: Grand Champion Darkover Don’t Dream It’s Over, English springer spaniel, handler Ellen Cottingham, Amboy, Wash.
Hound: Grand Champion Polo’s the Aviator, Afghan, handler Lorianne Amadeo, Vancouver, B.C. Working: Grand Champion Kingslynne-Kimo NW Connection, bullmastiff, handler Ed Thomason, Rochester, Wash.
Terrier: Champion Afterall Painting the Sky, wire fox terrier, handler Gabriel Rangel, Rialto, Calif.
Toy: Grand champion Windemere’s Dusting of White at Pevyne, Pekingese, handler Cody Koch, Reno. Non-Sporting: Grand Champion Brighton Lakeridge Encore, standard poodle, handler Tim Brazier, Mill Creek, Wash.
Herding: Grand Champion Blueisle’s Bourree, Australian shepherd, owner Barbara Hager, Southworth, Wash.
Best junior handler: Nicki Short, Vancouver, Wash., Cardigan Welsh corgi. Obedience high in trial: Jeannie Dennard, Eugene, Ore., 199, OTCH HC Redtop Sidekick, border collie. Sporting: Grand Champion Oakley’s B’Dazzled, English setter, handler Tara Schultz, Bonita, Calif.
Hound: Champion Eskai’s Sir Kasper, red bone coonhound, handler Kevin Chestnut, Moses Lake, Wash. Working: Grand Champion Caryola’s Antigua, Doberman pinscher, handler Andy Linton, Vancouver, Wash.
Herding: Grand champion Bendigo Kasey of Willowbrook, Australian cattle dog, handler Tyler Crady, Redding, Calif.
Best junior handler: Nicole Shriver, Kirkland, Doberman pinscher. Obedience high in trial: Sharon Colvin, Seattle, 198, OTCH Webshire’s X-Pecta Freeze, golden retriever. American Grand Champion McVan’s Be Bop Baby (“Betsy”), a Scottish terrier owned by Vandra Huber and Michael Krolewski, of Seattle, won its breed Sunday at the prestigious Crufts Dog Show in Birmingham, England.